The region’s transit system—CTA, Metra, Pace and the Regional Transportation Authority (RTA)—officially celebrated Earth Day 2014 yesterday and continues today by reminding everyone of the many benefits of using our region’s mass transit system. Throughout the week, the transit agencies are sharing two new transit benefits each day, rounding out the week with the overall Top Ten Benefits of Transit on Friday, April 25. Public transportation saves 37 million metric tons of carbon dioxide annually—the equivalent to the emissions resulting from the electricity generated by serving 4.9 million households. Public transportation use in the United States saves 4.2 billion gallons of gasoline annually. Households near public transit drive an average of 4,400 fewer miles than households with no access to public transit. This equates to an individual household reduction of 223 gallons per year. Public transportation use saves the equivalent of 900,000 car fill ups every day. 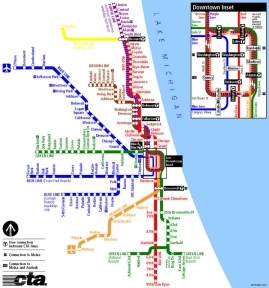 Nearly half of all work trips made from the suburbs to downtown Chicago are made on Metra. For every passenger mile traveled, public transportation is twice as fuel-efficient as private automobiles, sport-utility vehicles, and light trucks. Metra has been installing automatic stop-start technology on its locomotives to restrict idling, which saves fuel and reduces pollution. The agencies are joining together to encourage riders who traditionally use the transit system to continue to do so this week and invite new riders to make this week the week they “get on board,” with the many environmental, economic and health benefits of using our world-class transit system. Learn more about the transit’s system plan for improving sustainability by reading the Chicago Regional Green Transit Plan at www.RTAchicago.org.